The association between vitamin K2, or menaquinone, and cardiovascular health continues to grow. Two recent studies involving almost 17,000 postmenopausal women suggest that increased vitamin K2 intake, particularly of the longer chained menaquinones like menaquinone-7 (MK-7), promotes healthy vascular calcium balance and cardiovascular function. Vitamin K1 did not have a similar effect. MK-7 is found naturally in the fermented soy product natto and has unique properties compared to other forms of vitamin K. In contrast to vitamin K1 which concentrates in bone, MK-7 concentrates in vascular tissue. It also has a much longer half-life, allowing for sustained activity. MK-7 supports the carboxylation of matrix Gla-protein (MGP), a key protein involved in calcium balance. As a result, it supports healthy arterial blood flow and vascular elasticity. Optimal serum levels of vitamin D are also important to maintain healthy calcium balance in vascular tissues, in part by supporting the activity of mgP. Studies indicate that the combination of vitamins K and D provides synergistic support. Vitamin K supplementation may be contraindicated for those taking Coumadin/warfarin anticoagulant medication. 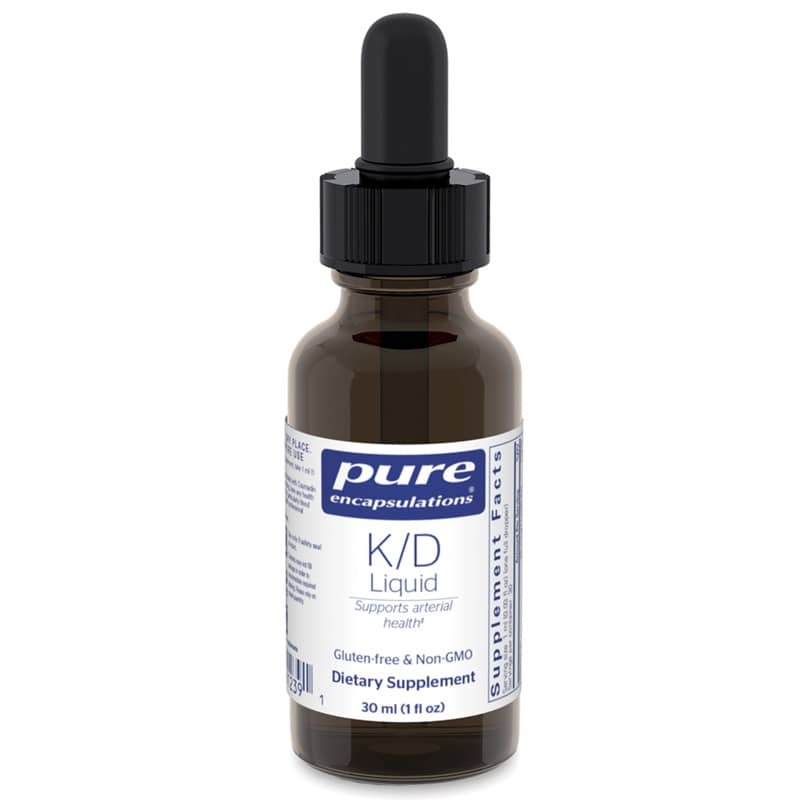 K/D liquid provides powerful support for arterial health and cardiovascular function. Mena7 is a trademark of NattoPharma, Norway. Other Ingredients: sunflower oil, natural vanilla flavor, mixed tocopherols. Adults: As a dietary supplement, take 1 ml per day, with a meal.